Our B-17 weathervane is a tribute to the brave pilots and crew of our WWII long range bomber. Its new mission?.the perfect weathervane. 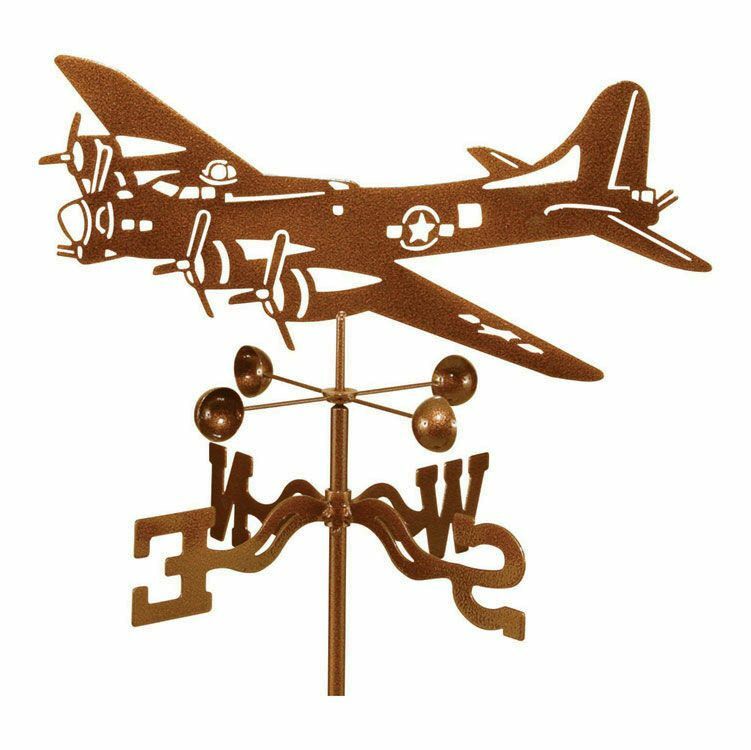 Airplane Weathervanes: This B-17 Airplane Weathervane is made of 14 gauge steel. The B-17 Airplane Weathervane is laser cut eliminating any unsightly welding producing a more attractive weathervane. Unlike some other brands that just show a silhouette, the B-17 Airplane Weathervane has laser cuts in strategic places adding dimension, style and detail to the weathervane. The photograph does not do justice to the beautiful, warm, brown finish. Each weathervane goes through 3-step coating process. Zinc chromate plating is applied to the base metal for better adhesion, durability and rust prevention. An attractive antique copper vein powder coat is baked on the surface. A clear powder coat is then applied to protect against UV rays to help prevent fading and providing a durable and scratch resistant product. The weathervane arrives with the airplane figure, sealed ball bearing windcups allowing the windcups to spin with the lightest breeze, directionals (about 2 ¾" high), and your choice of mount. The B-17 airplane figure measures about 18 ¾" long by 9" high. This weathervane has a 1-year manufacturer’s warranty on the finish and a lifetime warranty on all workmanship. Select the mounting choice from the drop down menu. Pole: about a 60" pole that slides into the ground. Roof: for peaked roof tops with about a 12" rod. Deck: mounts horizontally with a 4"x4" base and about a 12“ rod. Post: mounts vertically with a 4"x4" base and about a 12" rod. This was a 1st time experience with the company and products....was great! I don't often leave reviews, but the quality and service was exceptional. This was a memorial gift for a good friend and not only was I very happy with the product, it brought comfort and a smile that will long be remembered and enjoyed. ProsReceived the item very quickly and great quality. As described. Beautiful in the garden! Looks much better than it does in the photograph. The B-17 is well constructed of heavy duty materials. I was impressed by the design and the fit of all the parts. Something that sits out in Pacific Northwest weather all year must have a good paint job. The paint is better than good, it's great! Other weather vanes we looked at would never take winter weather. This one will. This B-17 was purchased in honor of a family member, 2nd Lt. Dale Franklin Watterson, who was lost in a B-17 over Germany in WWII. He is still MIA. ProsWell made, easy to assemble, durable, does what it is designed for. Great experience and great service. Received quickly. Would definitely order again. Thanks.